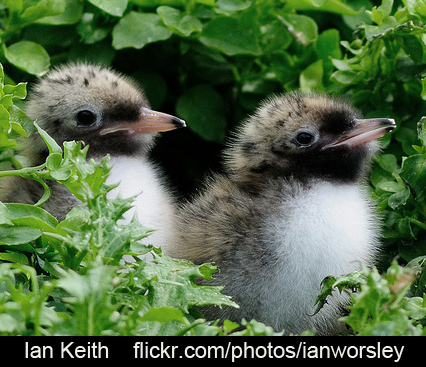 The Arctic Tern is a super-star of migration! 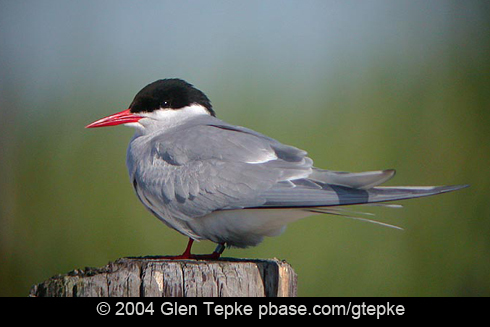 One of the world champions of long-distance migration is the Arctic Tern. Arctic Terns nest across the far northern reaches of the continent during our summer, then fly south to Antarctica for the rest of the year. Some will circle the polar ice-pack before heading north again, completing a total round trip of more than 50,000 miles. Every year. Imagine yourself in the stratosphere, looking down on North America. In spring and fall, you’ll see what look like huge “rivers” of ducks, seabirds, shorebirds, raptors, and songbirds. Migrants are moving along the four major North American flyways. In the spring, these “rivers” of birds flow north. At the end of the breeding season, the “rivers” flow south. 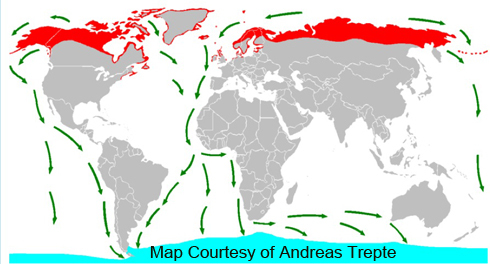 You can see a map of this amazing migration. Begin at our website, BirdNote.org. I’m Mary McCann. Sounds of the migrating geese provided by Martyn Stewart at Naturesound.org. Call of the Arctic Tern used with permission from Kevin Colver from the Field Guide to Bird Songs, Western Region.